Welcome to the Cartoon Map Capital of the World. The Florida Keys map was a map-making marathon in June of 2016. I lived and breathed Florida Keys for the whole month. This was an advertising-funded map, supported by merchants in the Florida Keys. I slightly modified the map to disguise the ads around the sides. This was one of the more ambitious maps in my career. There are thousands of little islands (cays) in the keys. I think I got most of them. We started out at an 11x17 format, and when I found that the complexity of the map was such that 11x17 wouldn't do justice to it, I moved it up to 18x24. Even at that size, it was still a challenge to draw. Landmark on the Sound has for many years been a senior living facility, formally a Masons retirement home. Since it was built by the Masons in 1926, it has come to live up to its name as a landmark in the Des Moines, Washington area, with a beautiful facade, and a commanding view of Puget Sound. As of 2016, Landmark on the Sound was sold. I don't know what it has now become. I drew this map in 2009, and somehow it "fell through the cracks" and never got posted on my web site. So here it is. Better late than never. Bear Country Lodge is a resort located on Harrisburg Lake deep in the Adirondack Mountains. The area surrounding the Antietam Battlefield, just south of Hagerstown, Maryland offers many tourist amenities to those visiting the battlefield. 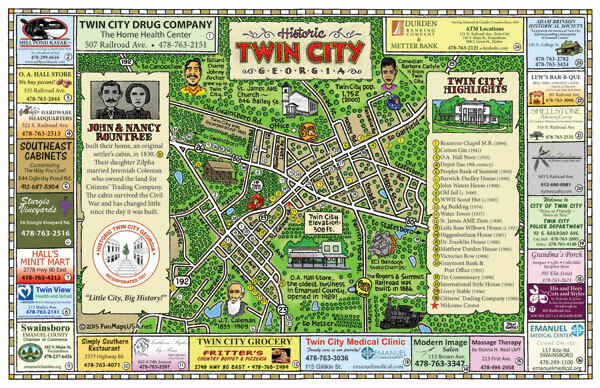 The business woman that we worked with on this project saw the sizable marketing opportunity and contacted us to create a cartoon map of the area. She chose to call it The Small Town Hop and Shop, referring to all of the small tourist shops in the small towns scattered around the area. This cartoon map demonstrates the broad marketing opportunities available to an enterprising marketing person...anywhere across America. The Antietam Battlefield is one of countless tourist attractions that would benefit from a humorously illustrated map. The Trinity River is a 165 mile long river system localed in the wilderness of Northwestern California. A hunting and fishing paradise, fishing enthusiasts travel great distances to angle for King salmon and steelhead. Designated a Wild and Scenic River, through most of its course, the Trinity River cascades through deep canyons and along scenic mountain meadows. I was contacted by the Trinity County Recreation Conservation District to create an illustrated map to promote the Trinity River wilderness. Typical for most cartoon map projects, the client continued to send me more changes and additions to add to the map. They also requested that I accurately depict the Trinity Alps, the rugged mountain range that encompasses the area. Standard procedure for most government projects, the changes dragged out over an extended span of time. I began work on the map on November 30, 2014, and finally finished it on December 16, 2015, a span of 12 1/2 months. It's always a relief to finish a map. Trinity trivia: Grateful Dead founder Jerry Garcia's father drowned in the Trinity River. Columbus, Georgia is known throughout the South as the city with the whitewater rapids running right through the middle of town. 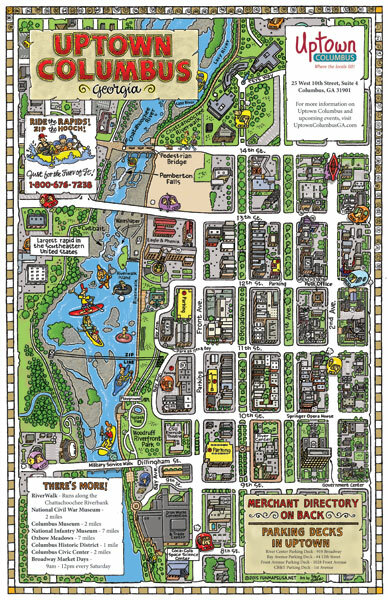 The Columbus Uptown Merchants Association contacted me to create a cartoon map to promote the whitewater rapids as a tourist attraction. We started the project with the idea of including a select number of key merchants in Uptown Columbus to feature on the map. Before we were finished, I ended up including every building, bush and fireplug in Uptown Columbus. It turned into an extremely time-consuming project before it was over, but it illustrates what a cartoon version of a dense downtown area can look like. This map should serve the merchants of Uptown Columbus for many years to come. Things that might go unnoticed on the map: I spent a long time drawing and rendering the rocks in and along the edge of the river, as well as the pattern in the river walk where it crosses the river. There is also a lot of hand-lettering on this map. My cartoon maps always include my hand-lettering. I'm very grateful that I taught myself to letter when I was in eighth grade. It has served me well on almost a daily basis throughout my life. This illustration wouldn't technically qualify as a cartoon map. It falls into the category of "busy illustration", another one of my specialties. I was contacted by Barrons Lumber Company, an east-coast lumber chain, based near Washington DC.They wanted me to create an illustration that would visually demonstrate the structure of their company. I went through a lot of draws and redraws until we finally arrived at this, the final product. Client comments: "Wow.....fantastic job. It is amazing...way better than I expected. Please know that this map will be a valuable and treasured tool for our company." One of my favorite aspects of the cartoon map business is discovering new towns around the country and learning about them. Twin City, Georgia is a quaint southern town situated next to one of Georgia's most unique parks, George L. Smith State Park (above). I enjoyed learning about the history of Twin City, as well as some of the unique historical characters and businesses in Twin City, like the O.A. Hall store. Client comments: "A tremendous success! The map is fabulous. It's just spendid. A wonderful job. We're so excited about it." This is the second edtion of the Buckley Map. The first edition was published in 1999. If you compare the two, you will find a marked difference in the intensity of the color. The original was painted in watercolor, which produces a muted low-intensity hue. I produced several dozen maps in watercolor until I caught on to Photoshop. This new edition was colored in Photoshop with a Wacom Cintiq. Photoshop colors are ideal for coloring cartoon maps, because bright colors enhance the effect of cartoon maps. I was contacted by Green Mountain Power of Rutland, Vermont to create an "Energy Trail" cartoon map for the town. Rutland is a leader among towns in America for alternative energy development. This map highlights the solar energy "hotspots" around town. The focal point of the map was intended to be the downtown district, so I caricatured all of the downtown buildings. In January of 2013 I was contacted by Bernalillo County, New Mexico. They asked me to produce a cartoon map for them, similar to the cartoon map that I drew for the nearby town of Aztec, New Mexico. It is now September of 2014, one year and nine months later, and I finally just finished the Bernalillo County map project. The old saying: "The wheels of government turn slowly" certainly applies here. But my contact in Bernalillo County was very pleasant and easy to work with, which was a great benefit. This was a long-haul project with many weeks of changes, corrections, stops and starts. But it's always a good feeling to finish a complex project such as this one. I might add that what you see is only one half of the project. The other side of the map contains four smaller "call-out" maps that highlight areas of the city that require more detail. I would be remiss if I didn't mentioning the big surprise that I received yesterday. I got a call from a man who lives here in the Puget Sound area of Washington State, near where I live. He had been visiting friends in Bernalillo County and he had just driven back to Washington State. He happened to be friends with one of the team members that I worked with on the Bernalillo County map project. They sent him back to Washington with a giant gift basket to give to me, filled with many items unique to Bernalillo County. I was thrilled and delighted with their thoughfulness. Special thanks to Catherine and Amanda, key members of the Bernalillo County team for their continued help and encouragement throughout the project. My favorite cartoon map projects are, without a doubt, tropical island maps. I have always been attracted to tropical islands, and I love to draw them. Eleuthera is an island in the Bahamas, situated 50 miles east of Nassau. It is an unspoiled off-the-beaten-track island. This makes it a special hideaway for those who want to escape the throngs of tourists that flock to Nassau and Grand Bahama. Situated in the central portion of the long narrow serpentine island is the district of Governor's Harbour, a quaint village on the west side of the island. I was contacted by the owner of a luxury guest house in Governor's Harbour to create a map of the area to serve as a guide for tourists that visit the area. If you would like to see take a 60-second tour of Governor's Harbour, click here. This is my first cartoon map of a school district, for Stillwater School District in Stillwater, Minnesota. They wanted to find a unique and novel way to promote their school district. I think they made a good choice. My mother and father-in-law were particularly interested in this map because my father-in-law's parents lived on Lake Elmo, which is in the Stillwater School District. Client comment: "It looks great!" If you're planning on visiting the Bahamas on your next holiday, and you're passing through Freetown, you might enjoy taking a Segway tour from Segs by the Sea. With the Seg tour comes the illustrated map above that we created. It shows you the attractions to visit as you motor along on your Segway. Client comments: "We are so excited, Bron! This looks amazing! I can't stress how happy we are with the map! I remember studying the Tennessee Valley Authority in high school. Little did I know at the time that I would one day be creating a cartoon map of this renowned power plant and the surrounding countryside. The object of the illustration is to document the progress of their current construction project. My completed map was created in an "11 x 17" format and enlarged into a giant display poster, then placed at a point within the work area where the workers can view the map on their way to and from their job. As each phase of the project is finished, a car that I created is moved to the next "station" along the track until it reaches "the end of the road" and the project is finished. The poster allows the workers to visually moniter the progress of the project. Using Google Streetview, I was able to depict the terrain and environment in the area that surrounds the plant.